Einsteinium is a member of the actinide family. The actinide elements are found in Row 7 of the periodic table, a chart that shows how chemical elements are related to each other. The actinides fall between radium (element number 88) and rutherfordium (element number 104). They are usually listed in a separate row at the very bottom of the periodic table. Einsteinium is also a transuranium element. Transuranium elements are those beyond uranium on the periodic table. Uranium has an atomic number of 92, so elements with larger atomic numbers are transuranium elements. Einsteinium was discovered by a research team from the University of California at Berkeley. The team was led by Albert Ghiorso (1915- ). The element was discovered in the "ashes" after the first hydrogen bomb test in November 1952 at Eniwetok Atoll, Marshall Islands, in the Pacific Ocean. The discovery was a remarkable accomplishment because no more than a hundred millionth of a gram of the element was present. It was detected because of the characteristic radiation it produced. Element number 99 was named after German-American physicist Albert Einstein (1879-1955). Some people regard Einstein as the greatest scientist who ever lived. Too little einsteinium has been prepared to allow scientists to determine its physical and chemical properties. Einsteinium does not occur naturally in the Earth's crust. All isotopes of einsteinium are radioactive. The most stable is einsteinium-252. Its half life is 20.47 days. 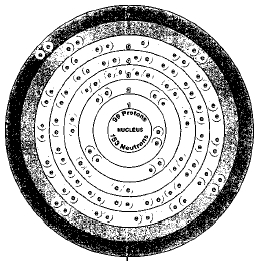 Isotopes are two or more forms of an element. Isotopes differ from each other according to their mass number. The number written to the right of the element's name is the mass number. The mass number represents the number of protons plus neutrons in the nucleus of an atom of the element. The number of protons determines the element, but the number of neutrons in the atom of any one element can vary. Each variation is an isotope. A radioactive isotope is one that breaks apart and gives off some form of radiation. The half life of a radioactive element is the time it takes for half of a sample of the element to break down. For example, suppose that scientists made 10 grams of einsteinium. About three weeks later (20.47 days later), only 5 grams of the element would be left. After another three weeks (20.47 days more), only half of that amount (2.5 grams) would remain. Einsteinium is not extracted from the Earth's crust. Einsteinium is sometimes used for research purposes, but it has no practical applications. There are no commercially important compounds of einsteinium. Albert Einstein. The element einsteinium is named after the great physicist. 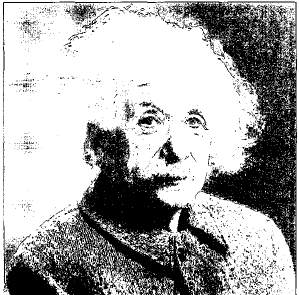 Einsteinium was named after the great German-American physicist, Albert Einstein. Scientists know too little about einsteinium to be aware of its health effects. As a radioactive element, however, it does pose a threat to human health. Very, very detailed. I can reconmend the website to my students for research.